You can accomplish a lot in 38 years. Just ask Local 2010 member Dennis Kramps. During his career at ATCO, Dennis helped build thousands of trailers and kitchens for work camps, served as shop foreman, worked as shipper/receiver, and drove one of the biggest forklifts in Alberta. 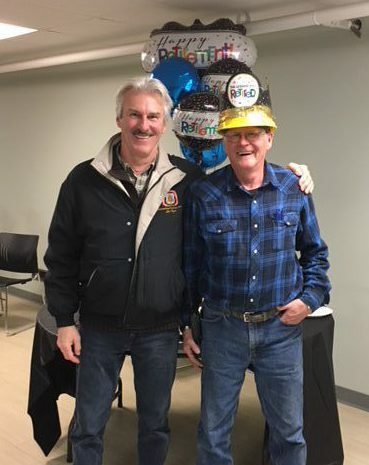 The longest-serving employee at ATCO’s Spruce Grovefacility, Dennis worked alongside his union family and his actual family as well – brothers Claude and Gene who were both worked for ATCO for over 20 years. “Gene was a siding expert and could do an entire 60-foot trailer in one day, and Claude did electrical and plumbing,” says Dennis. He also had a chance to work together with his brother Albert, who was a machinist and drove the forklift, and nephews Colin and Mark worked as welders. It wasn’t always smooth sailing though. The up-and-down Alberta economy provided its share of layoffs during his first 10 years at ATCO. Whenever Dennis and his brothers were laid off, they would work construction and over the years, the brothers built seven private homes, “Between me and Gene and Claude we can do a whole house,” he adds. Though he’s retired, this 65 year-old doesn’t know the meaning of the word. “I don’t think I’ve stopped working,” muses Dennis. “There are so many jobs people want me to do. I build cabinets, renovate houses and basements, and there’s plenty of work.” Add gardening and driving the tractor around his property and Dennis has enough to keep him busy for a long while. On behalf of everyone in Local 2010, congratulations on your retirement Dennis and on a job well done.